The Sears Priscilla was a Dutch Colonial sold in the late 1920's. Surprisingly, the national database of Sears houses has many Priscillas on the East Coast but only one Priscilla listed in Illinois--this one in Gurnee. I was able to authenticate the house with a mortgage record from Sears Roebuck. 817 N. Rogers Rd., Gurnee. Photo from Realtor site. 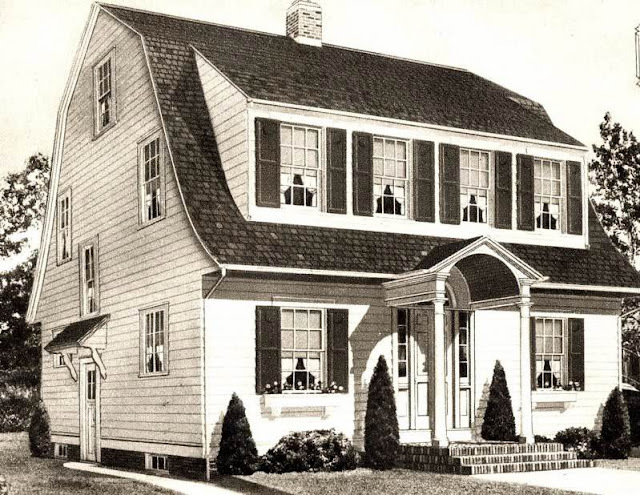 Sears Priscilla from the 1928 Modern Homes catalog. The living room of the Priscilla, as shown in the 1926 Modern Homes catalog. The Priscilla in Gurnee has the Sears Colonial Stairway. There's the same hutch in the dining room, as shown in the 1926 Modern Homes catalog. Ernest F. and Aimee Hemmens took out a mortgage for $6,400 from Sears Roebuck in April 1926. Ernest worked as a painter, and Aimee was a stenographer at the Great Lakes Naval Center. The couple divorced around 1937 and sold the house. Great that you were able to find a mortgage and a real estate listing, so we could see inside. Hi, I don't think 702 Merrill is, just based on the roofline. Sorry about the delay; I somehow lost a bunch of comments.